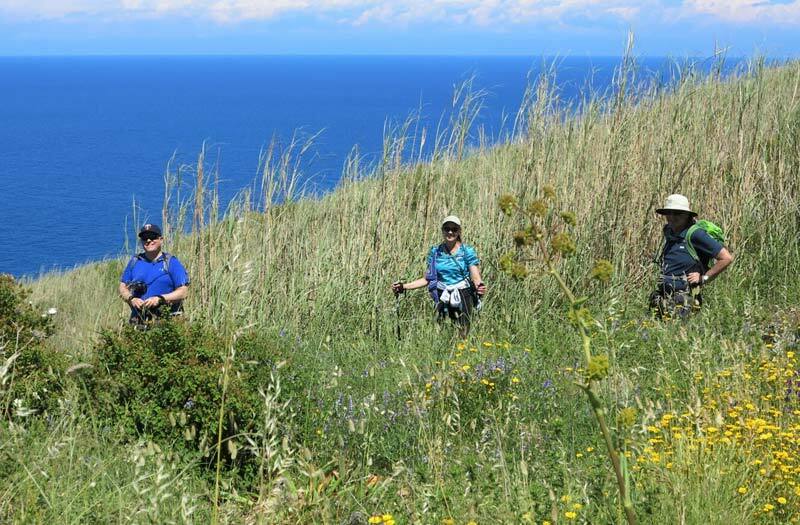 Rendezvous in the city of Catania and transfer to the spectacularly situated town of Taormina and enjoy a relaxing 5 km (3 mile) walk with striking views of powerful Mt. Etna puffing in the distance. After a welcome lunch, we continue walking along an ancient and hidden stairways into the town of Taormina, and visit the ancient Greek theatre in a stunningly beautiful position, the most magnificently situated theatre in all of Sicily. Transfer to a luxurious villa-style hotel on the slopes of Mt. Etna with striking views of the volcano, and enjoy upgraded rooms and time to relax by the pool. Dinner in a favorite restaurant packed with locals. We drive through graceful, dusky towns built of black lava stone to the lower slopes of Mt. 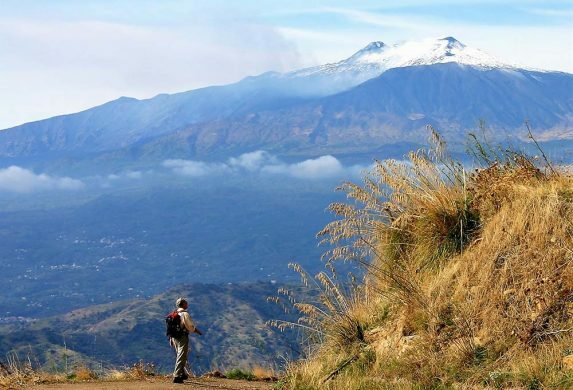 Etna, the powerful active volcano that dominates Eastern Sicily. Our exciting 12 km (7.5 mile) walk takes us across the lava fields from the 1983 eruption above the town of Randazzo, which the lava flow narrowly missed. 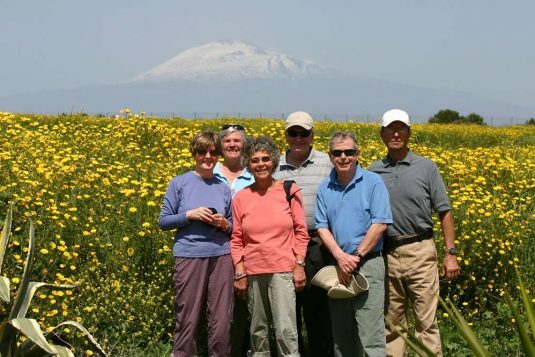 A short transfer brings us the manicured vineyards of one of Sicily’s top wine producers, where we indulge in a lavish wine tasting of prestigious Etna wines during a lunch of seasonal specialties. Drive to Syracuse, where we will be staying for two nights in the heart of the picturesque old quarter of Ortygia in deluxe rooms in a sylish hotel just steps from the Duomo. Tonight we dine in a noted restaurant serving classic Sicilian dishes in a warm atmosphere – choose at you like from their varied menu. Morning visit of Syracuse with an expert local guide, touring the archeological park and magnificent Greek theatre, still used for performances during theatre festivals. Stop for a short visit at the archeological museum to view some of the treasures unearthed from the ancient Greek reign. 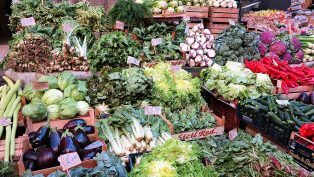 Then it’s on to the market, raucous and colorful, with a fabulous variety of fresh produce spilling into the streets. Enjoy a casual lunch of local cheeses and deli specialties in a bustling corner of the market. Time to relax before we visit a local friend’s workshop, where traditional Sicilian puppets with elaborate costumes are still meticulously handcrafted one by one. Watch a rollicking puppet show replete with sword-brandishing knights and damsels in distress. Free evening for dinner. 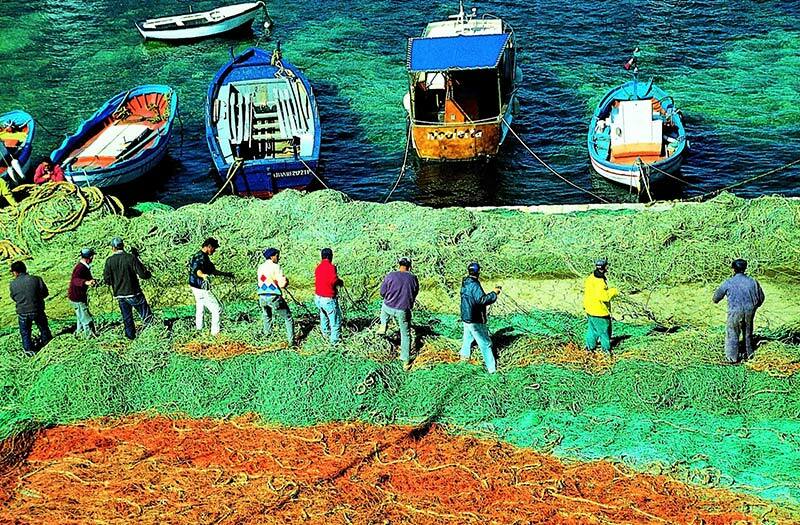 We drive south to the nature reserve of Vendicari, a sparkling gem of unspoiled coast scented with eucalyptus and wild thyme, and walk for 8 km (5 miles) along the ancient Greek road bordering the impossibly blue sea. Enjoy a rustic lunch in the shade of a carob tree before we visit the delightful Baroque town of Noto. Continue to Ragusa, where we stay in the best rooms in a boutique palazzo- hotel for two nights. 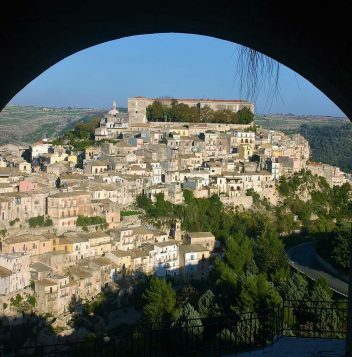 Ragusa is an undiscovered jewel that we’ll discover together on foot – this is our neighborhood where Emanuele grew up – and we join the local scene for the evening passeggiata from the upper to the lower town of Ibla. 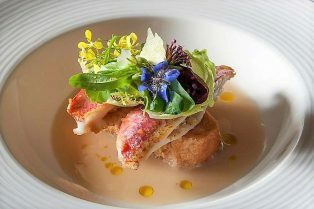 Meet Sicily’s most acclaimed chef, Ciccio Sultano, whose restaurant Il Duomo boasts 2 Michelin stars. Indulge in a multi-course dinner paired with some of Sicily’s most respected wines, before blissfully staggering back to our hotel. Our 15 km (10 mile) walk meanders past peaceful farms framed in artful dry-stone walls, and brings us down through a deep canyon shaded by carob trees. We emerge below the intriguing old town of Ragusa Ibla, where fanciful Baroque churches and splendid gardens vie for our attention. Short but spectacular drive through the hills brings us to our home, a restored stone farmhouse in a peaceful setting. Taste Sicily’s wonderful array of cheeses during an authentic Sicilian lunch prepared by Emanuele and served in our home overlooking our Mediterranean garden. After lunch, depending upon the season, we may visit an olive press to see olive oil being made and taste the freshly pressed “green gold,” or visit a carob mill where we learn about the uses of this highly prized crop. 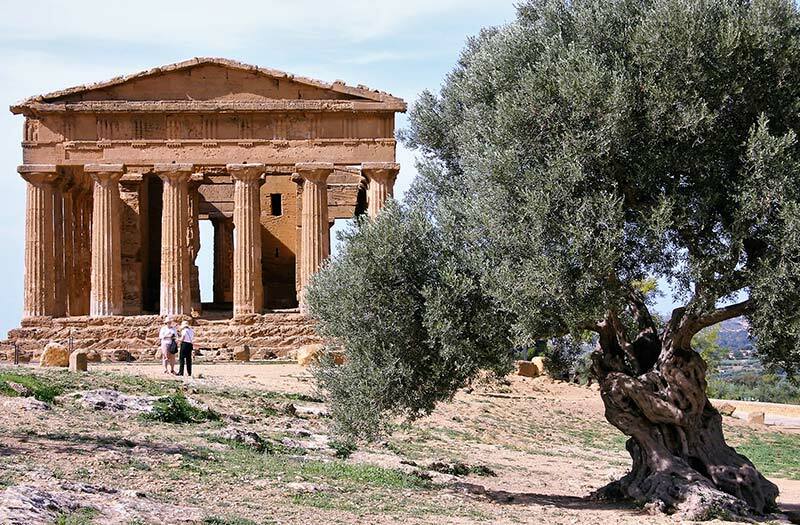 We depart for Agrigento, where a local expert will be our guide through the Valley of the Temples, as we view some of the best preserved Greek temples in the world. Continue along the coast to Eraclea Minoa, an ancient site in a spectacular position – on the beach below we’ll sample delectable fish couscous, scooped out of a steaming cooking pot. Continue westwards to our next hotel perched on a hilltop with views stretching out to the sea and the Egadi Islands. 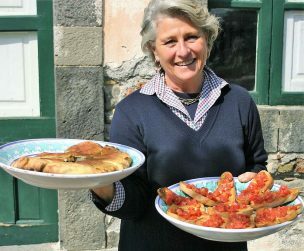 Join the local crowd at sunset for an aperitivo overlooking the sea-salt pans, before a classic Sicilian dinner based on locally caught seafood. Wind up the hairpin turns to the top of Monte Giuliano to the unique hilltown of Erice. Wander the polished stone streets to the stunning overlook by a Norman castle and stop for a rejuvenating almond sweet in the town’s many pastry shops. Walk along the imposing ancient walls to the city gates, and through open countryside with striking views. Stop for a luscious picnic lunch before continuing our 12 km (8 mile) walk by the seaside. Prepare for a festive evening with our Sicilian folksingers serenading us as we dine on an all-Sicilian menu. Morning transfer to Palermo airport to arrive by mid-morning (earlier transfers can be arranged.) Arrivederci!